We visit Lydia hotel apartments in September. The self-catering facilities were good, we did not expect facilities as in our home. It is a hotel. The cleanliness in the hotel was excellent. The cleaners were visiting our room daily excpept sundays.we had clean towers almost every day. The food was good. Mostly american food and some greek menu. The hotel staff was great, friendly and ready to help you with any kind on enquires that you may have. The entertainment was great also, special the Greek night, but also the other days. We were, like many at the Lydia, allocated on arrival. Initial impressions were good as the pool and garden areas were immaculately kept. However, despite arriving in the afternoon there was no rooms ready for us and another couple. When we were allocated a room it was very basic and slightly shabby. Not at all what we had hoped for given the outside impression. Cleanliness was questionable. Food at drinks at the hotel bar were pricey compared to oher establishments. A family with children wanting drinks and ice creams would very quickly go through some euros! When we ate there the food was basic but OK. The younger staff were friendly enough but the older staff were somewhat abrupt. One girl had money stolen from her room when we were there but had short shrift from the management when she went to talk to them (on the recommendation of the rep)! The location was fairly good though. Initially we thought we were in the middle of nowhere but after talking to an English bar owner at the end of the road we realised there was everything you could want - bars, restaurants, historical sites, harbour, etc a few minutes walk away. I was a bit apprehensive about the apartments from reading the recent reviews however overall we had an excellent holiday in average accomodation. Accomodation - we were in a studio apartment and it was very small. The bathroom/toilet is little bigger than a toilet cubicle and there was only a wardrobe for storing clothes. However, from seeing other apartments they all seemed different in size and layout. The room had an air-conditioning unit which worked fine and was without charge. Self Catering facilities are very limited although I didnt use anything, there was a portable hob (2 rings) and a few random pieces of cutlery and plates etc in a very fusty smelling cupboard! I imagine if I had been planning to cook on holiday (as if!) I would have been disappointed. The actual apartment interior was quite run down, (grubby marks on the walls and floors) which makes the place look unclean when in fact all it needs is a bit of a paint and tidy up. We had no problems with the cleaning, bins and linen were changed regularly. The pool and surrounding areas were nice and well kept. Soft drinks at the bar were 2 euros which in my experience was no more expensive than any other bar or restaurant in Kos Town so I feel it is unfair to say this is particularly expensive. Surely if you have kids or are on a budget then you should make use of the fridge in your apartment and stock up on drinks etc from the local supermarkets and head back to your apartment for drinks/lunch. Beer at the pool bar was standard price, however spirts were a bit pricey (again, very cheap at the supermarkets). The snack bar was a little bit more expensive than some other cafes in the town but then that's expected I think. I found the owners more or less kept themselves to themselves, they use the inside part of the bar as a sitting area in the evening and serve at the bar in emergencies only! The bar staff were very friendly, and Manos was a good laugh. The BBQ night was a good night, with George (the Bulgarian handyman) providing much of the entertainment. We heard of money going missing from apartments and fingers being pointed at the cleaners - advise from the rep is to speak to owner who then advises to phone the police, hmmm! We got a safety deposit box and left no money of valuables in the apartment, better to be safe than sorry. With Greek apartments being low rise, a break ins could happen anywhere in Greece, nevermind the cleaners so it's a bit daft to leave any thing of value in your apartment anyway. The cleaners seem to be hanging around 24/7, one is married to George who lives with the family so it's all very cosy! The apartments are located a 10-15 minute walk in to the town centre - the resort itself is huge with lots and lots of shops and places to eat and drink. The harbour area is lovely and there is loads to see and do for all ages and interests, you definately wont be bored. We had a tour on the train that tours round the town and we tried out a few of the resturants that we seen and would have missed otherwise. We found eating out very cheap, an evening meal with a couple of drinks was around 25 euros, however drinks down by the harbour were a bit pricey (around 6 euros for a big cocktail). The resort is very international with a range of tourists especially Danish and Scandinavian people. Would recommend Kos Town 100% - apparently Thomsons are taking over the Lydia Apartments from next year so maybe standards will improve. 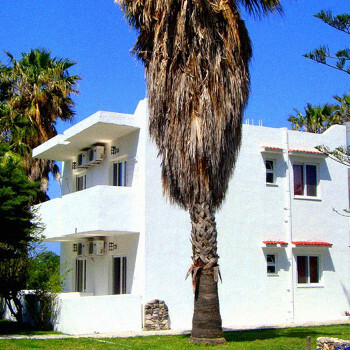 The accomdation is far from poor but it could be alot better - however apartments in a cheap deal to Greece aren't going to be luxury so dont expect excellent standards and you will probably be pleasantly surprised! We had an allocated on arrival holiday. We were pleasantly surprised once we arrived at Lydia apartments. Everywhere looked clean and tidy and the staff were nice and helpful. Our room was very basic and we expected a bit more from a self catering holiday. There wasn't any facilities to do some proper cooking. The location of the Hotel was good once we got our bearings. Food was beautiful we had many a meal sat by the pool throughout the day. Staff especially the Bar man was wicked really pleasant and friendly. Entertainment especially Greek night was fantastic as we all got involved. I would visit this Hotel again as I've a lot of wonderful memories. The grounds and swimming pool area are lovely and very well looked after, unfortunately the rooms are not. We, like other holiday makers during our stay had to ask for clean linen and towels on day 5! In all we had the towels changed 3 times and sheets twice - very poor. The staff here seem very thin on the ground hence the cleaning staff cannot possibly get around all the rooms as regularly as you would expect. The barman does the cooking generally and I would say cooking is not his strong point. Drinks are expensive at the pool bar also. It's such a shame as apparently this complex was very popular up until recently and although as mentioned the grounds are lovely and the pool area also the accommodation is a let down. The beds are very uncomfortable (the worst we've had in Greece) - wooden boxes with a thin lumpy mattress. Our children fared even worse - L-shaped sofa and on arrival we had no bed linen for them had to ask twice before receiving any. This sofa proved totally unsuitable for our 16 year old daughter who ended up in one of our single beds and we shared the other! We love Greece (this is our 3rd time) but the accommodation certainly had an impact on this holiday - Kos town is lovely just stay somewhere else. Even though they had air-conditioning this did not make up for the fact that they the rooms were not cleaned, minimum linen change etc. I stayed at the Lydia Apartments in September 2004. The hotel is off a dirt track road. The hotel itself was very nice, the area near the swimming pool was clean and tidy. The bar was cheap enough for drinks, and the staff at the bar were great as they are now friends of mine. Also I found the hotel room to be clean as the cleaners were in every day to clean them.. but the only problem I had where the rooms were too small.